From I-75 take Exit 427 (US-90 East) approximately 12 miles. Facility is on the right. 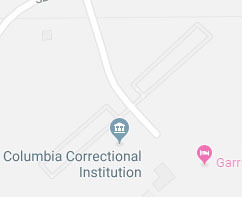 Please Note: GPS systems and mapping sites such as Mapquest, Bing Maps, or Google Maps often provide incorrect directions to our prison facilities using the physical address. Please use the above directions when traveling to this prison. Historical Information: This facility was established in 1997 to house male youthful offender inmates. It is operated by Corrections Corporation of America under contract with the Department of Management Services. In response to Chapter 958, Florida Statutes, mandating that those inmates who are youthful offenders be provided enhanced program services, the Extended Day Program was developed. This is a 16-hour daytime program provided at all youthful offender institutions that is designed to provide at least 12 hours of activities. The program is structured to include work assignments, education, including vocational and academic programs, counseling, behavior modification, military style drills, systematic discipline and other programmatic opportunities aimed at reducing inmate idleness and enhancing the young inmate's chance at becoming a law abiding citizen upon re-entry into the community.